In creating Snow Rose, Floris took inspiration "from a sunlit unfolding of warmly scented rose petals crystallised within a winter wonderland." 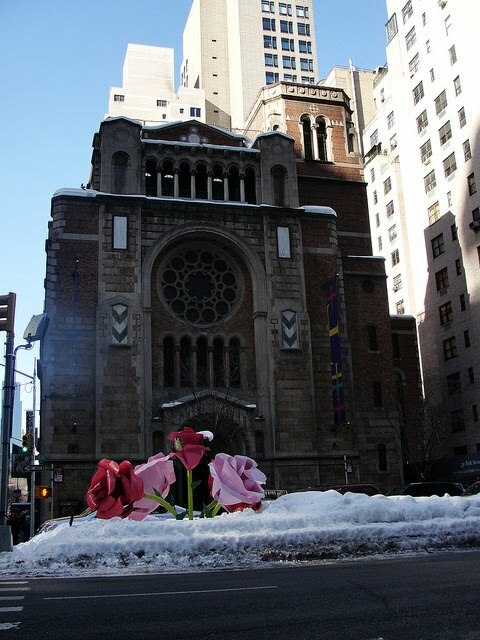 This describes quite perfectly Will Ryman's Roses installation on Park Ave. in Manhattan, which, thanks to the non-stop snowpocalypse we've been having, has been covered in snow all winter, and thus, by default, became Snow Roses for the season. They are not scented, but if they were, this is how they could smell. With it's powdery feel and soft vanillic base, Snow Rose is a comfort scent, and goodness knows, one needs comfort during blizzards. There is a subtle burst of green in the top notes, but I wouldn't call this verdancy cold. It is a winter rose for me exactly because it is warm, not icy. Nor would I like a cold rose anyway. I appreciate how delicately the powdery quality is done in the composition. On a powderiness scale from 1 to 10, where Talco Delicato is 9 and Teint de Neige 13, Snow Rose is about 6. Which is just right. I am surprised not to see orris among the listed ingredients; to me, the powdery feel of Snow Rose has a certain raw, vaguely earthy characteristic that I usually associate with the note. Sandalwood and vanilla in the drydown are a simple delight. Everything about this perfume is uncomplicatedly lovely and comfy. A comfort scent done with so much understated grace perhaps could only have come from an English brand. My sample of it arrived, fittingly, from England too, kindly sent by Vanessa, who writes one of my favorite blogs, Bonkers About Perfume. In her review of Snow Rose, Vanessa called the scent, "fluffy", which to me is a quality of a comfort scent and thus solidifies the status of Snow Rose as such. Snow Rose is a limited edition scent, but I do seem to see it on Floris website, £38.00 for 50ml. In the States, it is available at shoplondons.com, $70.00. Image sources, 1, 3- Huffington Post, 2 -artfeedonline.com, 3- agent j loves agent a on flickr. A fluffy, comforting rose scent? Mmmm, sounds very good (especially as I'm feeling cold these days). 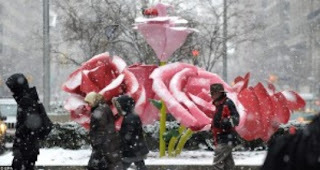 I love these pictures, the snow-covered roses look wonderfully incongruent. If that perfume smells like this picture, I want to try it for sure. Winter just wouldn't relent this year...now LA is expecting a snow storm they say?! You should, it is such a soft little charmer, if you don't mind a little bit of powder. I was at first shocked, then giggled, when I first smelled Cefiro, the only Floris I've tried thus far. It seemed at first to me to be a candied lemon confection, and the second impression was the same, but the initial jarring effect had worn off. I'm still dying to try (was it) Indolice (?). I will backtrack and find that website again...it sounds too good to be true! I do mind powder, but loved this review anyway. You have really been enjoying that art installation, eh? I love rose and I love powder, though I have yet to find a Floris that loved me. Perhaps this will be the one! I cannot say anything about the perfume, but that installment is fantastic! I would take detours to take a look at it. 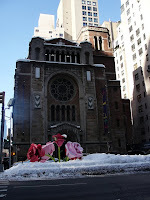 That roses installation captures this scent perfectly - what a lovely enhancement to the streetscape of Manhattan. I am not familiar with Talco Delicato, but I do so agree that Teint de Neige is a 13 on your scale! PS Am very happy you like Snow Rose, and thanks for the name check!